Based on legendary VOX amplifiers, this amp simulation plug-in includes 6 Control knobs, Speaker Emulation with Bypass, Stereo Mode Switch and Boost Switch. The P&M Magic Queen is a unique type of overdrive/distortion guitar amp plug-in that was designed to emulate the distortion characteristics of Vox tube amps. 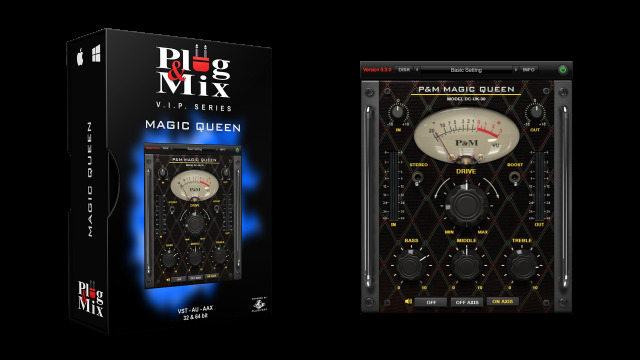 The PM-Magic Queen is an overdrive plug-in that provides a wealth of dynamic overdriven tones with superior tonal control. The PM-British Tone produces an exceptional natural response. The PM-Magic Queen can be used as preamp or take advantage of the built-in speaker emulation for a full guitar amp simulation.